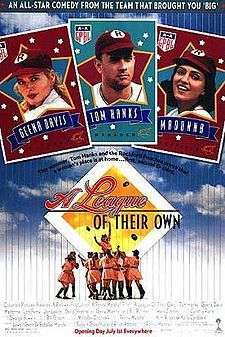 A League of Their Own is a 1992 American sports comedy-drama film that tells a fictionalized account of the real-life All-American Girls Professional Baseball League (AAGPBL). Directed by Penny Marshall, the film stars Geena Davis, Tom Hanks, Madonna, and Lori Petty. The screenplay was written by Lowell Ganz and Babaloo Mandel from a story by Kelly Candaele and Kim Wilson. In 1988, Dottie Hinson (Geena Davis) attends the opening of the new All-American Girls Professional Baseball League (AAGPBL) exhibit at the Baseball Hall of Fame. She sees many of her former teammates and friends, prompting a flashback to 1943. When World War II threatens to shut down Major League Baseball, candy magnate and Cubs owner Walter Harvey (Garry Marshall) persuades his fellow owners to bankroll a women's league. Ira Lowenstein (David Strathairn) is put in charge, and Ernie Capadino (Jon Lovitz) is sent out to recruit players. Capadino attends an industrial-league softball game in rural Oregon and likes what he sees in Dottie, the catcher for a local dairy's team. Dottie turns down Capadino's offer, happy with her simple farm life while waiting for her husband Bob (Bill Pullman) to come back from the war. Her sister (and teammate) Kit (Lori Petty), however, is desperate to get away and make something of herself. Capadino is not impressed by Kit's hitting performance, but agrees to take her along if she can change Dottie's mind. Dottie agrees, but only for her sister's sake. Dottie and Kit head out to Harvey Field in Chicago for the tryout. There they meet a pair of New Yorkers, taxi dancer "All the Way" Mae Mordabito (Madonna) and her best friend, bouncer Doris Murphy (Rosie O'Donnell), along with soft-spoken right fielder Evelyn Gardner (Bitty Schram), illiterate, shy left fielder Shirley Baker (Ann Cusack), pitcher/shortstop and former Miss Georgia beauty queen Ellen Sue Gotlander (Freddie Simpson), gentle left field/relief pitcher Betty "Spaghetti" Horn (Tracy Reiner), homely second baseman Marla Hooch (Megan Cavanagh), who was scouted by Ernie, Dottie and Kit in Fort Collins, Colorado, and first baseman Helen Haley (Anne Ramsay), a native of Saskatchewan. They and eight others are selected to form the Rockford Peaches, while 48 others are split among the Racine Belles, Kenosha Comets, and South Bend Blue Sox. The Peaches are managed by Jimmy Dugan (Tom Hanks), a former marquee Cubs slugger who initially treats the whole thing as a joke. The league attracts little interest at first. With a Life magazine photographer in the stands, Lowenstein begs the players to do something spectacular. Dottie obliges when a ball is popped up behind home plate, catching it while doing a split. The resulting photograph makes the magazine cover. A publicity campaign draws more people to the ballgames, but the owners remain unconvinced. Due to Kit's sibling rivalry with her sister, she is traded to the Peaches' rival, the Racine Belles. The Peaches end the season qualifying for the league's World Series. In the locker room, Jimmy gives Betty a telegram that informs her her husband was killed in action in the Pacific Theater. The grief-stricken Betty leaves the team. Later that evening, Dottie receives a surprise when Bob, who was serving in Italy, shows up. He has been discharged from the Army. The following morning, Jimmy discovers that Dottie is going home with Bob. He is unable to persuade her to at least play in the World Series; he tells her she will regret her decision. The Peaches and Belles meet in the World Series, which reaches a seventh and deciding game. Dottie, having reconsidered on the drive back to Oregon, is the catcher for the Peaches, while Kit is the starting pitcher for the Belles. With the Belles leading by a run in the top of the ninth, Dottie drives in the go-ahead run. Kit is the final batter. Under immense pressure, she gets a hit and, ignoring the third base coach's sign to stop, scores the winning run by knocking her sister over at the plate and dislodging the ball from Dottie's hand. The sellout crowd convinces Harvey to give Lowenstein the owners' support. After the game, the sisters reconcile before Dottie leaves. Back in the present, Dottie is reunited with several other players, including Kit, whom she has not seen in several years. The fates of several of the characters are revealed: Jimmy, Bob, and Evelyn have died, while Marla has been married to Nelson, a man she met in a bar, for over 40 years. The original Peaches sing a team song composed by Evelyn and pose for a group photo. Mark Holton as Adult Stillwell Gardner. He attends the Peaches' reunion at the Baseball Hall of Fame on behalf of his mother who had died. Discussing the skirts they wore playing baseball in the film, Geena Davis said on MLB Network's Costas at the Movies in 2013, "Some of our real cast, from sliding into home, had ripped the skin off their legs. It was nutty." The film was released on July 1, 1992 and was #1 by its second weekend (July 10–12). It was a commercial success, making $107 million in the United States (and an additional $25 million worldwide) on a $40 million budget, and was well received by critics. Former players also made an appearance at Bosse Field in Evansville, Indiana on June 6, 2012, where many of the film's game scenes were filmed. The event included an outdoor screening of the film as well as a scene-setting display of cars featured in the film. In addition to Bosse Field, the production used Huntingburg, Indiana's League Stadium, another Southwestern Indiana field older than Bosse that was renovated for the film. ↑ "A League of Their Own (1992)". Box Office Mojo. September 29, 1992. Retrieved October 1, 2013. ↑ "Penny Marshall". Costas at the Movies. MLB Network. January 28, 2013. ↑ "A League of Their Own (1992)". Box Office Mojo. Retrieved October 2, 2008. ↑ Kronke, David (July 2, 1992). "Penny Marshall pitches 'League of Their Own' agenda". The Dispatch. Lexington, NC. Los Angeles Daily News. p. 4C. Retrieved October 1, 2013. ↑ White, Sue (October 26, 2011). "'A League of Their Own' brings former ballplayer to the Riverside Saginaw Film Festival". MLive. MLive Media Group. Retrieved October 1, 2013. ↑ Sidewater, Nancy (April 23, 2004). "DVD Q&A – Penny Marshall". Entertainment Weekly. Entertainment Weekly Inc. (761). Retrieved October 1, 2013. ↑ Rachlin, Jill (February 12, 1993). "A League of Their Own Review | Reviews and News". Entertainment Weekly. Entertainment Weekly, Inc. (157). Retrieved October 1, 2013. ↑ "AFI's 100 Years...100 Movie Quotes" (PDF). American Film Institute. Retrieved 2016-08-14. ↑ "Breakfast at Tiffany's added to film archive". BBC News. Retrieved December 19, 2012. ↑ A League of Their Own 20th Anniversary Blu-ray, retrieved June 28, 2015. ↑ Kekis, John (September 23, 2013). "Women Remain in League of Their Own". The Chronicle Herald. Retrieved October 30, 2012. ↑ Prell, Jon (June 12, 2012). "A League Of Their Own Comes Home To Bosse Field On June 22". Evansville Courier & Press. Retrieved October 31, 2012. ↑ "A League of Their Own". The Internet Movie Database. Retrieved 2008-12-01. ↑ "Filming Locations for A League of Their Own". Internet Movie Database. Archived from the original on January 9, 2012. Retrieved January 10, 2012.